Congress president Rahul Gandhi on Saturday said that his party might “give a surprise” to the people in the Hindi heartland state. New Delhi: Following the announcement of tie-up by Samajwadi Party and Bahujan Samaj Party in Uttar Pradesh for the 2019 Lok Sabha polls, Congress president Rahul Gandhi on Saturday said that his party might “give a surprise” to the people in the Hindi heartland state, adding that he has tremendous respect for Mayawati, Mulayam Singh Yadav and Akhilesh Yadav. “The BSP and the SP have every right to have an alliance. I think the Congress party has a tremendous amount to offer the people of Uttar Pradesh. So we will obviously do our best. 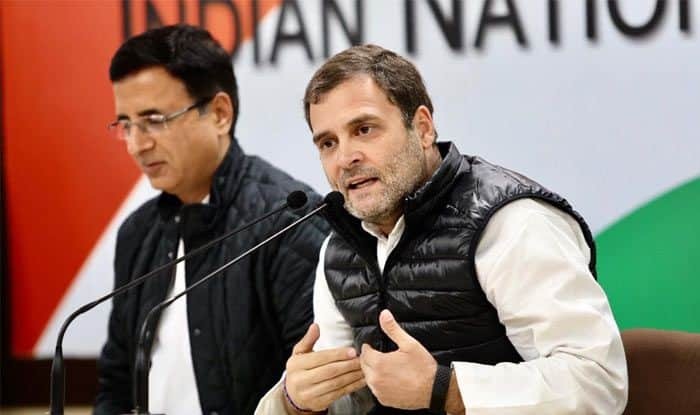 As the Congress party, we will fight for our ideology and I think we might give a surprise or two to the people about what the Congress party is capable of doing and how the Congress party can mobilise in Uttar Pradesh,” he said during a press conference in Dubai. Rahul added that the SP and the BSP had the right to take the political decision, but his party will fight the polls in Uttar Pradesh with its “full capacity”. Announcing the alliance in UP, Mayawati and Akhilesh Yadav, in a joint press conference on Saturday, said that their parties will share 38 seats each and keep the Congress out of the alliance. In his address at the BJP national convention a little after the UP development, PM Modi didn’t refer directly to the SP-BSP deal but dismissed opposition efforts at coalition-building as a “failed experiment” to bring in a “helpless government”. Explaining why the Congress was not included in the alliance, Mayawati said during that party’s rule over the years, poverty, unemployment and corruption grew and there were scams in defence deals. “Just as the Bofors scam uprooted the Congress, the BJP will witness the same fate because of its involvement in the Rafale scam,” she said, referring to the graft allegations against the ruling party in a deal for French military aircraft. She also said her party has not benefitted in seat-sharing pacts with the Congress. “In the past I have seen that our votes get transferred to the Congress, but not vice-versa. We do not gain from an alliance with the Congress, whereas the vote transfer is perfect in an SP-BSP tie-up,” Mayawati said. Drawing a parallel between the BJP and the Congress, the BSP chief said the Congress had imposed Emergency while the BJP is responsible for an undeclared Emergency. In 2014, the BJP had won 71 seats in Uttar Pradesh, which sends the largest number of MPs to the Lok Sabha. BJP ally Apna Dal bagged two. The SP won five seats and the Congress two, while the BSP drew a blank. Rahul added that the SP and the BSP had the right to take the political decision, but his party will fight the polls in UP with its “full capacity”. SP and BSP said they would not field candidates in Amethi and Rae Bareli, represented by Rahul Gandhi and Sonia Gandhi.